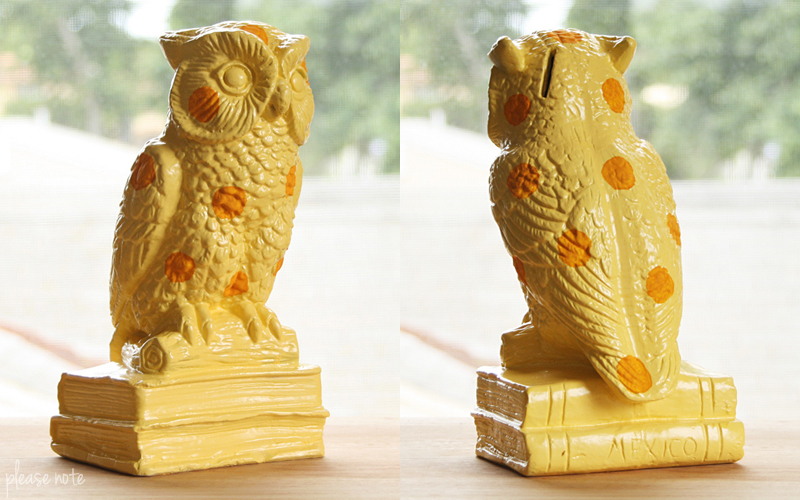 A few weeks ago my dad found this owl bank at a yard sale. I loved the owl but wasn't too fond of the colors so I decided to paint it. I liked the look of the plain yellow owl but thought it needed a little something extra so I made a circle stencil and added some dark yellow polka dots. Perfect! The only problem is... now I'm kind of in a polka dot frenzy. The side table in my bedroom is looking a little bare. I have a feeling that it's next. very cute! i have a thing for owls, too. :) my mom used to have an owl collection when i was growing up. sadly, she doesn't know what happened to it. Owls, who can pass one up really (I sure can't)? Really enjoyed what you did with this fine fellow... really fun! That looks really good! Before you painted it, it reminded me of candy corn. Isn't it amazing what a little paint can do?? I love the owl - so cute! Thanks, Amanda! Your blog is cute too! That looks great! I haven't tried the spray paint wonder trick yet, but I really want to. I need to take a thrift store trip soon!